As we’ve mentioned many times recently, there has been a resurgence in the performance of international equity markets of late. And as we noted the other day, this includes even perpetual laggard, Europe. One of the key drivers in Europe’s solid run recently has been the performance of the region’s financial juggernaut, Germany. 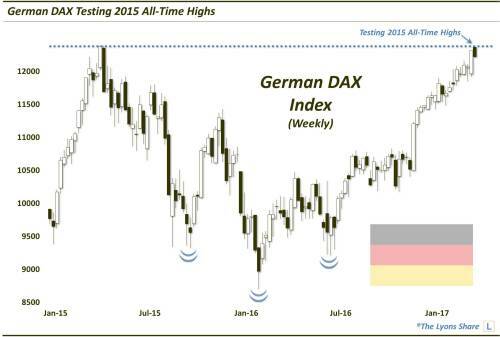 Since its launch point in early December, Germany’s key stock index, the DAX, is up some 20%. However, as with the challenges facing the broad STOXX Europe 600 Index that we mentioned in the recent post, the DAX may be facing an obstacle of it own. Specifically, the DAX is bumping into its all-time highs set in 2015 around the 12,390 mark. Its high from earlier this week was 12,375. So what should we expect from the DAX’s test of its all-time highs? We don’t like to forecast, but a reasonable reaction would be for the DAX to pause or consolidate its recent gains for some time prior to attempting a breakout to new highs. At least that would be the healthy thing for it to do. We have pointed out numerous examples in the past where stocks or indices have attempted to break out above prior highs without as much as a speed bump along the way. Such breakouts with prices already extended more often than not result in failure as the exhausted market lacks the fuel to sustain the breakout. That is why even DAX bulls should be rooting for a bit of a pause, or digestion, of its rally, prior to attempting to break out. Such a process may set the stage for a more sustainable breakout to new highs. There is enough to like about the DAX chart in the longer-term that should not be threatened by a short-term consolidation. That includes a potential huge inverse head-&-shoulders pattern from mid-2015 to mid-2016, as marked on the chart. Plus, a pause or slight retracement of the DAX’s post-2016 rally could well result in the addition of the “handle” to a potential “cup-&-handle” formation since the 2015 top. We are getting a bit ahead of ourselves now as the DAX has only just returned to its former highs this week. With all of the potentially bullish scenarios that may unfold in the longer-run, it is the immediate-term challenge that is most relevant right now. As such, we would expect these former all-time highs to at least provide a speed bump in the ongoing DAX rally here, if not an all-out roadblock for the time being. The iShares MSCI Germany Index Fund ETF (NYSE:EWG) was unchanged in premarket trading Thursday. Year-to-date, EWG has gained 7.70%, versus a 5.03% rise in the benchmark S&P 500 index during the same period.